This post is in honor of Brady and his new found love for all things with wheels. He is SUCH a boy! He loves rolling in the mud, getting dirty, climbing, trucks, tools, etc... But his latest obsession is definitely trucks and cars. All I hear all day is "Beep! Beep!" as he drives cars and trucks around our house. I have no idea what this image is, I got it in a swap. This card is a super quickie! I just colored the dump truck and matted it. 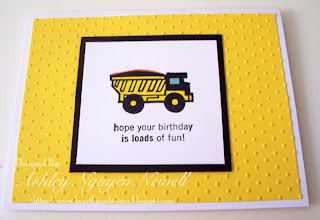 Then I used some yellow card stock that has been Cuttlebug embossed with the Swiss Dots folder. Easy peasy! I actually made this for the Ways to Use challenge on SCS last week. REALLY cute card! Submit this one!!! Brady and Liam would totally get a long! This is so cute and love the CAS look. So cute! It's almost identical! Love the colors and the truck is adorable. My nephew is like Brady... so cute! my son - at that age - was soooo into matchbox cars & trucks. this is awesome!